A Metre Matters | Whitehorse Active Transport Action Group Inc. Most states support this rule – three have legislated, and two are trialing legislation. Only Victoria and NT do not support this concept. The Greens introduced the Metre Matters Bill into Victorian Parliament in 2015. The Bill was referred to the Economic & Infrastructure Committee which handed down its report in September 2016, supporting the introducing of minimum passing distance laws. In March 2017 the Andrews Government announced it would oppose the legislation and it was defeated in the Victorian lower house! However there is a chance to get the Metre Matters law through parliament’s upper house, and refer it back to the lower house. But pressure needs to be exerted on the Government to rethink it’s opposition. Adopted and Trial Laws in other states for motorists passing bicycle riders. Passing a bicycle rider means that you (as a motorist) and the bicycle rider are traveling in the same direction. This includes when you are traveling side-by-side in separate lanes on a multi-lane road. It does not apply if you are traveling in opposite directions. The leftmost part of the vehicle, or something sticking out from the vehicle (e.g. a side mirror). The announcement of WA’s trial can be read by clicking here. 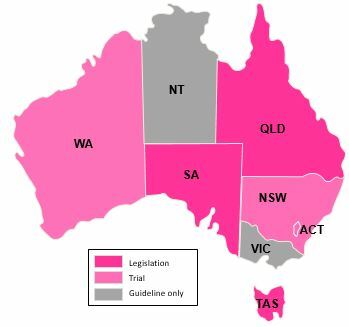 WATAG encourages the state government to implement the rule on the basis that combined with an education program, implementation of the rule would achieve greater awareness, would potentially lead to safety benefits for cyclists, and would help bring about a uniform national approach. If you’d like to have your say, you can sign a petition here.